A common source of leaks results from a warn out Mercedes valve cover gasket. 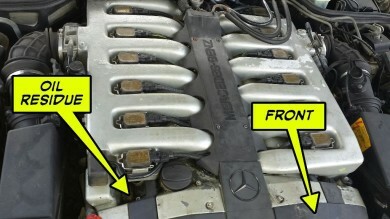 A Mercedes valve cover gasket replacement ensures a seal between the valve cover and the cylinder head. Valve covers are meant to be removable. However, each time that the valve cover is removed, there is a need to replace the valve cover gasket with a new one. The valve cover gasket is the highest part of the oil system. Often, when you notice a burning smell from under the hood you may need a Mercedes valve cover gasket replacement. When leaking, it coats parts underneath it with oil, down to the bottom of the motor, making it impossible to find other leaks. Rubber hoses, motor mounts and electrical connectors can all be damaged or broken due to oil contamination from a leaking valve cover gasket. Aside from damaged or broken components, a leaking valve cover gasket can also damage your rocker arms. A common cause for a leaking valve cover gasket are faulty PVC valves and crankcase breather hoses. Just confirming that you have damage to you valve gasket cover is a difficult procedure for “do it yourselfers.” You need to remove multiple parts and covers including air ducts and unplug wires just to get a look at your valve cover gasket. It is imperative to have the correct tools for this job just to prevent damaging the rubber coating that protects your electrical wiring. Bring your Mercedes Benz to GCD. We will clean your engine and drive your Mercedes to see if any additional leaks are present and were obscured due to oil contamination. GCD’s certified technicians will use the proper tools for the job and use tracer dyes and/or specialized camera systems to find and repair even the smallest of leaks. It is vital to have an experienced technician, like those at GCD properly remove your valve cover gasket. Improper removal will lead to warping and breakage. The most durable valve cover gaskets are those made of silicone or rubber. Bring your vehicle into GCD today and have your leaking/seeping valve cover gasket installed properly.